You Magnificent Bastards: Games this week. This week has been pretty busy with Warhammer and Warhammer 40k action, as it was my first week back from vacation. First up we had 2 Fantasy games on Tuesday night at Pandemonium. 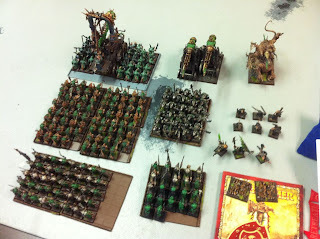 I brought the Skaven and the Tomb Kings out to learn a little about the TK's and hopefully get some practice with the Skaven before Blood in the Sun. Game 1 I decided to try out a few new models and the Tomb Kings rather than the Skaven against Ramon's Lizardmen at 2400 points. He brought what I consider to be a pretty standard list with a couple interesting units I don't see as often. Life Slaan, temple guard, 3 smallish saurus blocks, 2 skink/krox blocks, 2 units of salamanders. I brought a character light list. Hierophant, Prince, 40 warriors, 20 archers, 3 chariots, 30 tomb guard, 3 stalkers, 3 knights, hierotitan (proxy), casket, and a screaming skull catapult. The game went well for me as I pretty much had magic dominance. The casket's +d3 dice and the titan's +d3 to cast is pretty great. 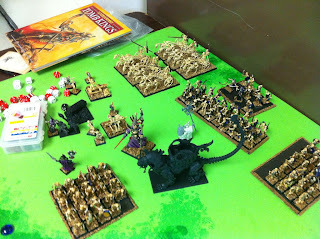 The Necropolis Knights performed well and ground out an entire unit of Saurus. So well in fact that I am currently taking apart my 3 other Stalkers to make into Knights. The Tomb Guard were the MVP. I ran 30 in horde formation with Halberds, and they walked through 2 units of Saurus and a unit of Skink / Krox. They are so expensive, but they really perform. I think I got 2-4 spells off almost every turn, usually attempting 6 (with bound items). In the end, all that was left was the Slaan and his TG. Next up I faced mi_whplayers and his Tomb Kings with my Skaven. We dropped down to 2200 to give Brian some practice for Buckeye Battles which is the same weekend as BITS. His list was a lot like what I like in my first Tomb King list, but without the Knights and Stalkers. Starting the game, I won the first turn and took a shot at the big Sphynx, and sniped it for 4 wounds. He returned by unloading his spell boosted archers and his catapults at the Plague Furnace, killing it in the first turn. While I was worried at this point so early in the game, my Hell Pit was straight away from his Tomb Guard and King. I spent the next turn magic/shooting and weakening this unit in order to hit it hard the next turn. My Grey Seer was able to Skitterleap and take out a catapult and the casket second turn, but then was left out in the open. Luckily I made it a point and was able to stop smiting next turn, so the 30 archers that turned to shoot the lone Seer were unable to kill him. On my third turn I smashed my HPA into the Tomb Guard, killed them and the King, and overran into the Hierophant and his bunker... ending the game early. 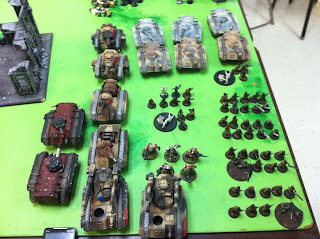 On Thursday I played in the final game of the Pandemonium / 40K Fight Club League. I made it through to the finals after the 4 game preliminary round and 2 game playoff. In the end I lost a brutal game to a tough mechanized Steel Legion IG list, where my dice refused to be any help all game. We played the Chaos mission from the Battle Missions book where all area terrain blocks all line of sight, and the terrain is either dangerous terrain, or adds +1 to cover saves. 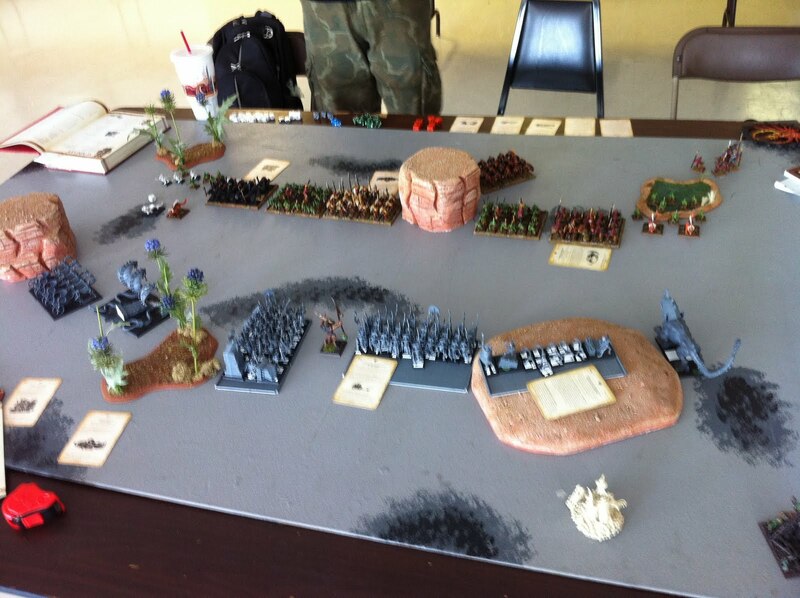 I had all of the dangerous terrain on my side of the board, and lost a LOT of wounds to DT moving forward. Congrats on 40k Armageddon on the league win. Back to the BITS practice this weekend. I am going to hit GW to look for 2400 point games and work on my BITS terrain. Blood in the Sun is in 2 weeks!